ConnectCode .Net Barcode SDK is an advanced and modern .Net compliant barcode generation Software Development Kit (SDK) that supports Microsoft Reporting Services, Crystal Reports, WPF and RDLC. It supports all commonly used linear barcodes in the industry including the modern GS1 Databar and is one of the most flexible barcode SDK available. This Barcode SDK is uniquely designed to achieve maximum scalability and flexibility for your project. 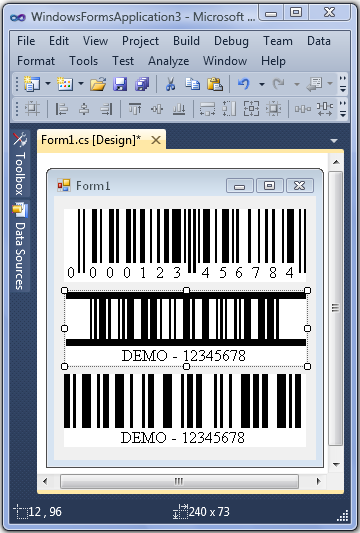 Due to this unique design, it is so powerful that you can use it to create barcodes for almost any scenarios in the Windows Operating System. Barcodes supported : Code39 Barcode, Code39 Ascii Barcode, Code93 Barcode, Codabar Barcode, Code128 (Auto/A/B/C) Barcode, I2of5 Barcode (Interleaved 2 of 5), Industrial 2of5 Barcode, ITF14 Barcode, Modified Plessy Barcode, POSTNET Barcode, EAN 13 Barcode (European Article Numbering), EAN 8 Barcode, UPCA Barcode (Universal Product Code), UPCE Barcode, UCCEAN Barcode, ISBN/ISSN/EXT2/EXT5 Barcode and GS1 Databar 14/Truncated/Limited/Expanded Barcode This new version provides a complete set of dynamic link libraries (DLLs) optimized for the .Net 4.0 Framework, Reporting Services 2012 and Windows 8. Inventory Barcode Software is barcode creating tool with distinctive features &amp; functionality. Inventory Barcode softwa offers various fonts such as UPC, EAN, Code 11, Codabar, Code 39 etc. create barcode list or import through XLS and txt files. Powerful and efficient barcode software for shipping facilitates user to create mass amount of elegant appearing and user desired shape and dimension barcode label images by providing advanced label image designing and printing tools and options. Gratis stregkode label design software gÃ¸r det muligt for brugere med forbedret funktionalitet til en effektiv kopiere og indsÃ¦tte den genererede stregkodebilleder i forskellige applikationer, herunder Windows MS Word, Excel, Paint. Powerful and efficient inventory tracking barcode maker program provides user finest options to design custom barcode labels, prints label images as per retails object shapes and stores every creates barcode labels for future reference and usage. Professional Publishing Industry Barcodes Generator software is an ultimate facility which helps to easily generate or print a beautiful looking printable book barcode labels, tags, stickers and library barcode labels within less time interval. Smart inventory control barcode generator program for business products crafts numerous copies and also builds smoothly scan able stickers. Barcode creator utility applies assorted options to design barcode tags of estimated size and measurements. Economical bar code maker software for publisher and library generates attractive labels, price stickers, identity card, security coupons, asset tags and many others in efficient way. Popular barcode maker for publisher tool support printing options. Professionally developed Publishing Industry barcode software makes you capable to generate easily printable, readable, scanable and colorful barcode images via all commonly used printers and scanners in most affordable and convenient manner. This site does not contain serial number, crack, keygen ConnectCode .Net Barcode SDK serial number : serial number is the simplest type of crack. A serial number(cdkey,product key,etc) is register the program as you may already know. a crack or keygen may contain harmful software. If you cannot find the exact version you want, just give it a try. for more information read .nfo/.txt/.diz file include in zipped file.